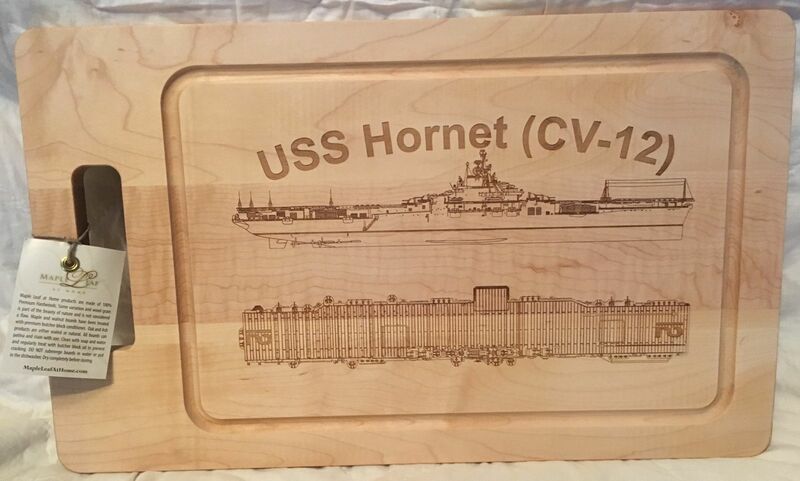 The USS Hancock has not been photographed yet but looks similar to the USS Hornet. The dimensions are 20" x 12." Our Maple Leaf cutting boards can be engraved with any of the artwork that you see on our web site and can be personalized on the front and back. You can order multiple styles of Artisan Boards and can pick the style that you want via the drop down in the upper left hand corner of the page. The artisan boards in the image are sorted in the same order as the drop down. This is a new product line for us and we have very few images of our new products. 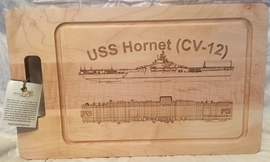 Whether a plane, ship, or tank, we can etch the image on the cutting board with the emblem and personal message. Please write in the comments section a description of the exact image that you want etched into the wood. The artisan boards are made from hard rock maple. Some variation in color and wood grain is part of the natural beauty of our spectacular boards.